The new BeagleBone Black is out and this good book telling you how to use it. 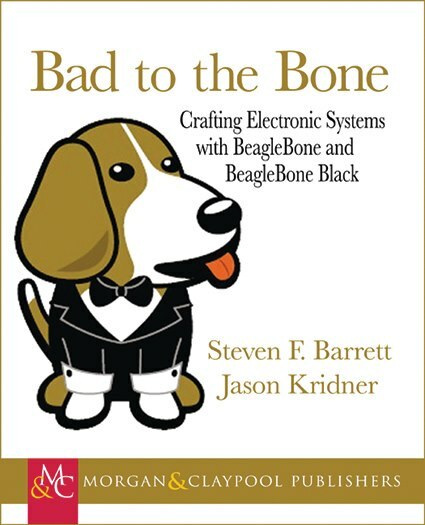 Bad to the Bone: Crafting Electronic Systems with BeagleBone and BeagleBone Black. 400+ pages of tutorials for both novice and experienced programmers by was written by Beagleboard.org community leader Jason Kridner, in partnership with Steven Barrett, a professor of engineering and computer science at the University of Wyoming. Bad to the Bone is available in paperback from Amazon for about $45 USD, or as a PDF download from the publisher for around $20 USD. Minimum System Startup required only the USB cable shipped with BBB. If you can't communicate to your BBB from Browser, Use Google Chrome Browser. There is Some Problem with Firefox. Never use Internet Explorer. ( HDMI to HDMI Mini cable also available it is not suitable for BBB). 5. Power Supply 5V, 1A ( You can start without Power supply (Use USB ), If you are a Power User , Some time BBB shows some abnormalities with USB Power . If you use USB try to use rear panel USB of your computer , Power capability of Front USB is slightly low. Don't Try opkg upgrade in you BBB Board, this will kill you BBB. BBB will work only after reflashing the eMMC. Current capacity of Begalebone black GPIO Ports is 6ma. Developers, makers, and hobbyists looking for a better alternative to Raspberry Pi. 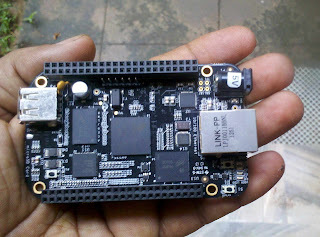 Now BeagleBoard.org has taken the wraps off a 1 GHz ARM-based board named the BeagleBone Black (BBB). You can use it as a Computer, Media Center, or the controller of your Robotic Project. One of the features that I am crazy about is the presents of ADC, PWM and lot of GPIO. As a Electronics and robotic developer, I like Beaglebone Black and is a wonderful choice!!!! The 3.4 x 2.1 in (8.6 x 5.3 cm) BeagleBone Black open-source Linux computer comes pre-loaded with the Ångström distro (which will boot in under 10 seconds) and Cloud9 IDE, freeing up the microSD slot for additional storage. It's based on the Sitara 1 GHz ARM Cortex-A8 processor from Texas Instruments, including a 3D graphics accelerator. There's 2 GB of integrated eMMC flash storage and 512 MB of DDR3 RAM. HDMI monitor, Keyboard and mouse is not must for a developer, Straight away you can connect BBB to your PC and start Development ( Now it will act like an Arduino). If you connect a Monitor, keyboard and mouse you can use it as a standalone PC.